Utilizing state of the art design and lens coating techniques, UNITRON’s Z10 Series provides users with an ergonomically designed, high magnification stereo microscope series that is ideal for routine inspections, failure analysis, quality control and life science applications. Designed as a modular system the Z10 Series is offered with an Ergonomic Viewing Body (0° ‐ 35°) or a 20° inclined binocular viewing body. The standard 10x eyepieces provided a best in class, 24mm field of view. Eyepieces are also available in 15x , 20x and 25x magnification. 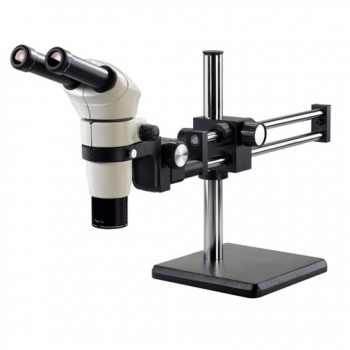 Click the button below to add the UNITRON Z10 Zoom Stereo Microscope Series On Ball Bearing Boom Stand to your wish list.